A Russian citizen launched an online petition demanding an apology from Korean netizens for insulting Olympic figure skating champion Adelina Sotnikova on Monday. on the petition uploaded to Change.org. The petition further read, “It was absolutely clear who is fighting for a medal and who did not even try to show that she is interested in medals. “Shame on you, Korean netizens. Shame on your country. Ask for forgiveness,” the petitioner said, adding that Korean fans have no manners. 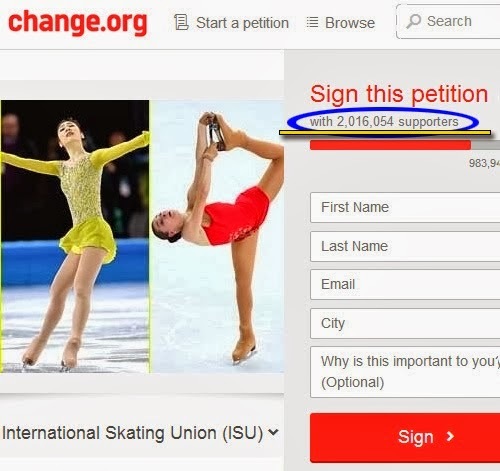 Shortly after the gold medalist was decided in the ladies’ figure skating singles competition at the Sochi Olympics, a petition challenging the results was set up at the popular online campaigning forum. The petition, calling for an investigation into the event’s judging, attracted slightly more than 2 million signatures, while the one seeking an apology from Koreans drew some 1,000 signatures mostly from Russian and Japanese users as of 5 p.m. Korean time on Wednesday.